The past few weeks have been challenging and productive. with most of the core architecture programmed for single player and multiplayer modes, content creation has been a key focus. 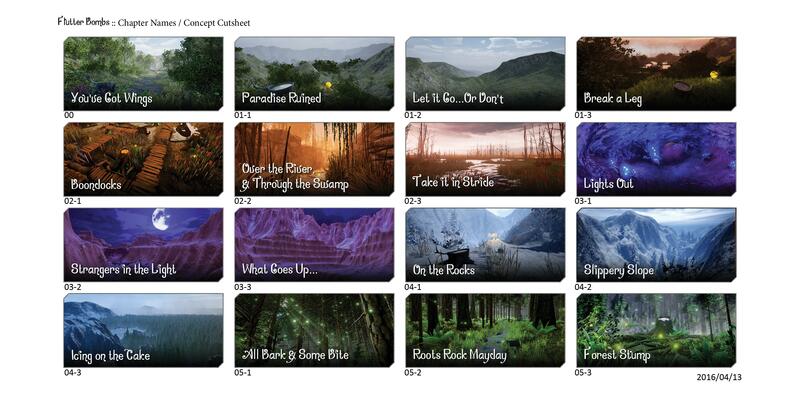 The narrative for the single player campaign has been roughed out with 16 levels to dive into. Each level is either a seek & destroy style level, a combat racing level, or a boss battle. The story takes the butterfly through mountain valleys, swamps, caves, mountain tops, and forests. Now that the levels have been roughed out using a variety of tools including world machine, some details are being built including the modular destructible assets, permutations of enemy base classes, custom depth buffer fx to help intuitive navigation, and integrating the sound fx and soundtracks that the sound team has been working on. Here's a video of the destructibles being tested. I had pretty poor luck in the beginning, as the first few spawned parasitic swarms rather than bonuses, but toward the end picked up a few bonuses. Lots to do as this level continues to grow in order to replace the original demo level. What's up bearkiddy! The iOS version is a twin stick shooter. This project has been constantly growing on a variety of platforms. The content in this summary is for the Xbox One release this fall. Will be experimenting with more mobile content down the road. Thanks for checking it out!